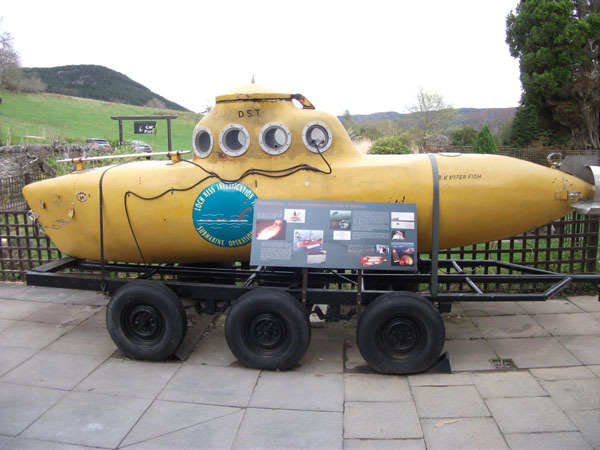 Submarines, or "submersibles" of various sizes and designs have been operated in Loch Ness since the 1960's. This one carried fare paying passengers during the summers of 1994 and 1995. It is difficult to see more than a very few metres, even when the sub has a large forward viewing port like this one. 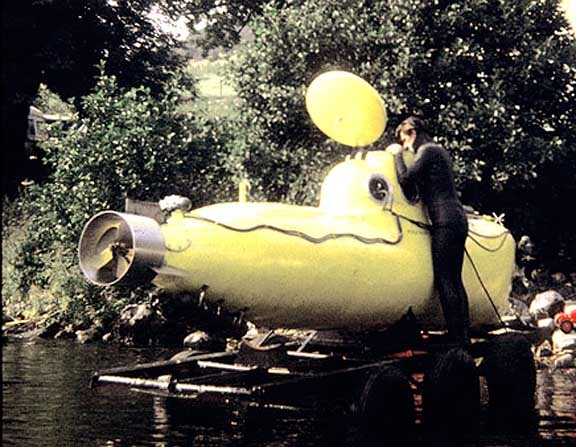 The external lights cast a yellow glow on the loch bottom, while inside, the crew members use red lighting to maintain their "dark adaptation". 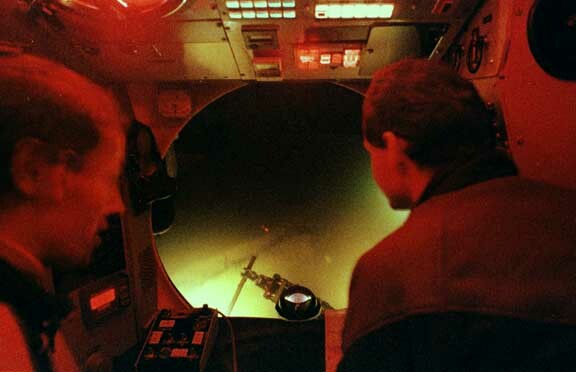 Machines like this, adapted from a "diver lock-out submersible" are usually "flown" just a few inches above the bottom, at a speed of about one mile per hour. This enables the pilots to stop within their "seeing distance" and so avoid obstacles and possible entanglement on debris. This vehicle carried a life-support capability for a full crew of six for over one week. This photo was taken at a depth of 450 feet. 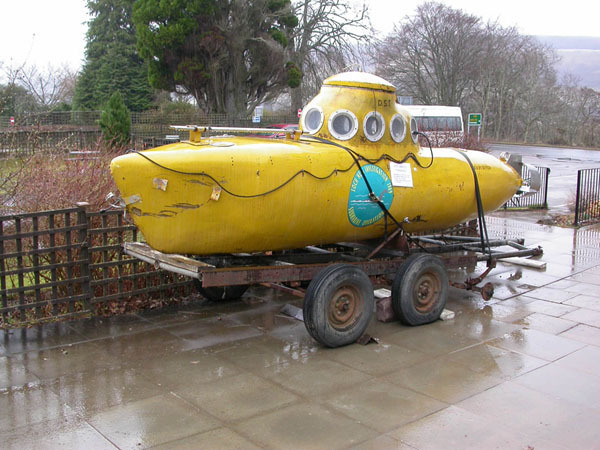 This evening photo shows Dan S. Taylor's first Loch Ness sub, "Viperfish" on its launching trailer. At the end of the pontoon can be seen Tim Dinsdale's camouflaged boat "Water Horse", and the LNI support boat "Fussy Hen", painted orange so we could find it. Photo Copyright Holly Arnold 1969, 2000. Another view of "Viperfish" being attended to by LNI staff member Martin Wilde. The one-man sub was the focus of much attention, and in both pictures the compressed air powered biopsy darts can be seen. These were intended to take a tissue sample of any large animal encountered in the loch. At the same time as Viperish was at the loch, Vickers Oceanics was testing a much larger Pisces class 3 -man submersible and was occupying Temple Pier itself, which is why Viperfish was relegated to a smaller jetty. In 2010 Viperfish returned to Loch Ness and is now at the Loch Ness Centre and Exhibition in Drumnadrochit, where she is seen here in her element, just after arrival and after a lick of paint, below. 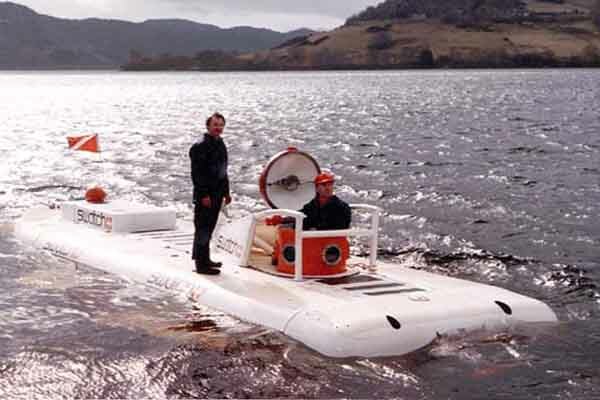 In 1973 another Vickers "boat" was brought to the loch for a series of fresh-water trials, this time under the auspices of the Academy of Applied Science. A PC8B, it could carry 3 people, and was the first sub at Loch Ness to have a large viewing port at the front, giving the occupants an excellent view of the loch bottom. 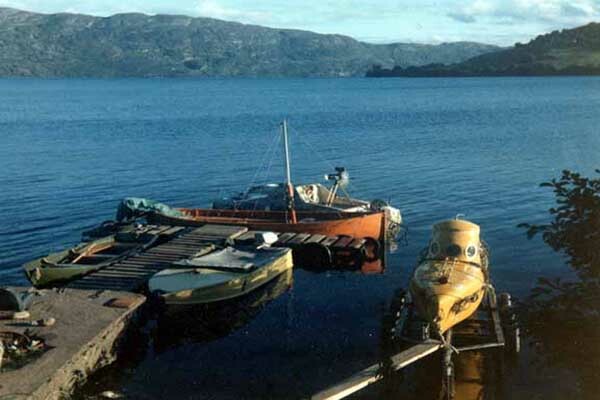 It is pictured here on the jetty at Corpach, near Fort William. 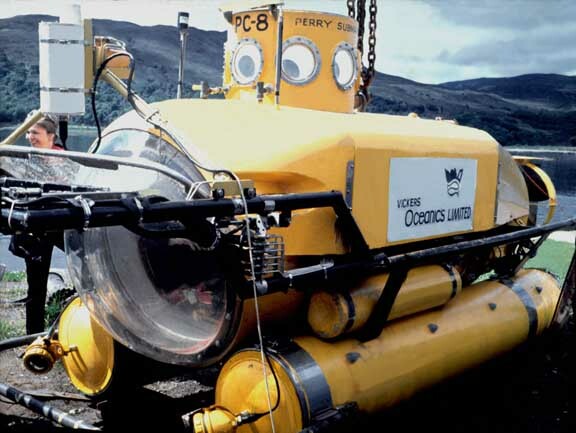 Vickers submersible PC8 used at Loch Ness in 1973.